Later tonight, fans will finally get to see Captain America: Civil War on the big screen with early preview screenings being held all across the country. One of the new superheroes making their Marvel Cinematic Universe debut in this epic adventure is Chadwick Boseman's Black Panther, who will go on to star in his own standalone movie set to hit theaters on February 16, 2018. While we have seen this Wakanda warrior in action in the previously-released trailers and clips, today we have a new preview that takes us behind-the-scenes with Chadwick Boseman himself. The preview offers some footage from Black Panther's rooftop fight with The Winter Soldier (Sebastian Stan), while Chadwick Boseman reveals that his character is unpredictable and always a step ahead of everyone else. The actor also shed more light on T'challa in an interview with USA Today, where he spoke about his character, and how excited he is to start shooting the Black Panther movie. Here's what he had to say about T'challa below. "You could be having a great time with him at a party, and all of a sudden he disappears and no one knows where he is. It puts him in a position where he's always going to be misunderstood by people. I love that aspect because it creates a dark side to him. I felt a constant anticipation of what's to come while doing this, which is a beautiful thing. You always know this is going to get better and better." We've known for quite some time that Black Panther is part of Team Iron Man in Captain America: Civil War, but in many ways, this mysterious character has his own agenda. T'challa is first introduced just before tragedy strikes during a terrorist attack, which The Winter Soldier is blamed for. 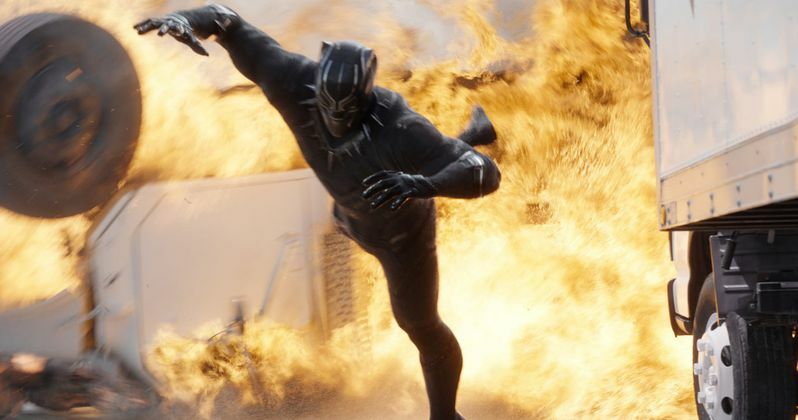 T'challa sets off on his own mission to go after The Winter Soldier, which we've seen in footage from their highway chase scene and rooftop fight. Producer Kevin Feige reveals that Black Panther isn't really on anyone's team. "He could really care less what Cap feels, what Tony feels. He's fresh eyes to their arguments and relationships (and) an equal with some of the power players, but has his own point of view about what's going on." As for the standalone Black Panther movie, Ryan Coogler recently came aboard to direct, with Boseman revealing that he talks to the filmmaker every week, and that they have a "good partnership." None of the supporting roles have been filled out yet, but Kevin Feige teased last month that director Ryan Coogler is currently co-writing the script, working from a draft originally written by Joe Robert Cole, with casting announcements to be made this summer and production slated to begin in early 2017. While we wait for more on the Black Panther movie, take a look at this new preview for Captain America: Civil War, before heading to theaters to see this adventure unfold later tonight.